Skimming is a type of theft where a small device is used to steal your credit card information in an otherwise legitimate credit or debit transaction. When the card is run through the skimmer, the device captures and stores all of the card’s magnetic strip information to be used later. 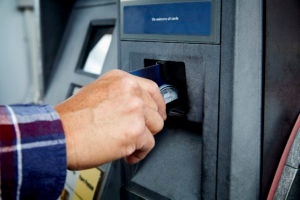 HOW CAN I PREVENT SKIMMING? Before swiping your card, check the device itself. Is part of the reader a different color or material than the rest of the machine? Does anything jiggle or seem loose? Are there signs of tampering, such as a broken seal? All of these may be evidence that a skimming device has been installed. When entering your PIN, use your other hand to cover the keypad. Thieves may be using a camera to capture your information. Once they have your PIN, a thief can withdraw money directly from your account or make fraudulent purchases. In addition, if a keypad doesn’t feel quite right; too heavy, loose, different color, etc., it may be an overlay to store your information. The last thing a 'would be thief' wants is to be caught installing a device on an ATM machine or other card reader. Low traffic areas, as well as areas easily accessible to the public, such as an ATM on the street, are at risk. To combat this, opt for machines that are located inside of businesses or your financial institution. 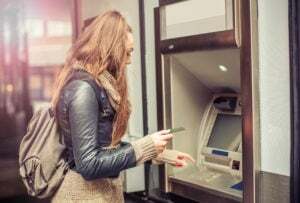 WHAT HAPPENS IF I'M THE VICTIM OF SKIMMING? If something appears out of place on your statement or you get an alert about a suspicious purchase, alert your financial institution or credit card company immediately. If you wait too long, you may be held liable for fraudulent purchases made after the theft. Cyprus Credit Union is now issuing chip cards to all of our members to help better protect their financial information. Once your card expires, the new card you are issued will automatically be equipped with chip technology. If you do not yet have a chip card and would like to switch now, please stop by a branch for more information.